A superb large Sycamore and pine dairy table, having an arrangement of 4 large drawers to one side with fruitwood knob handles and raised on tapering legs, the base retaining the original painted finish. The thick solid Sycamore top being a beautiful pale colour with a tactile smooth finish. This large table seats a maximum on 10 persons, having wealth of character and in wonderful condition throughout. English. late 19th century. 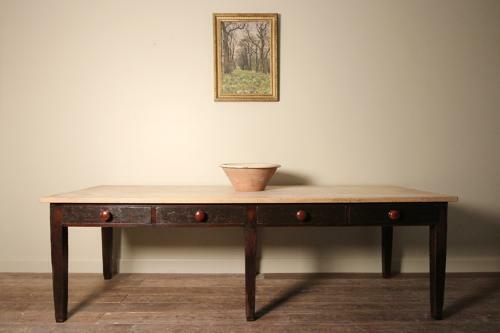 Tables of this type with sycamore tops were commonly found in country house kitchens, used as prep tables. This wonderful example is a rare survivor.